I’ve been playing around with the pattern a bit and designed a hat that you can add colourwork or stripes to easily. Basically it has less ribbing and I’ve siplified the design so that there aren’t any decreases to knit. Here’s a picture of the Shepherding hats that I’ve knitted. I’ve used the natural dark and white Jacob yarn as well as the blended Jacob. The hat pattern is a single size that should fit most adults. Casting on 88 stitches gives you a hat that has a 56cm circumference. If you want to change the size increase or decrease the number of cast on stitches. Eight stitches is approximately 5cm so reducing the number of stitches to 80 will make your hat circumference about 51cm. You will need to make sure the number of cast on stitches is divisible by 8 for the crown shaping to work. 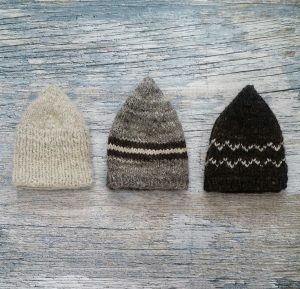 You can keep your hat plain and simple or if you’re feeling more adventurous incorporate your own stranded colourwork or stripe pattern. K1 P1 and join in the round placing a stitch marker at the start of the round.Continue K1P1 ribbing for 4 more rounds (5 rounds in total.) If you want to make the ribbing longer you can. You can also choose to do a Knit 2 Purl 2 ribbing as an alternative. Change to 4mm needles and Knit all stitches. Continue knitting until the hat measures 13cm from the brim or whatever height you prefer. You can knit all in one colour or change the colour of yarn and knit stripes. Crown decrease (decrease 8 sts every other round) switch to 4mm double pointed needles when necessary, for me this is usually at round 7. If you have changed the size of your hat by increasing or decreasing the number of stitches you will need to adjust which round you start on for the crown shaping. For example if you reduced the number of cast on stitches to 80 you would start on round 3 below. If you have increased the number of cast on stitches to e.g. 96 you would need to add 2 rounds round at the beginning. Firstly K10 K2tog repeat to end of round then a round of knit all stitches before starting at round 1 below. Break yarn and using tapestry needle pull yarn through remaining stitches. Block. Dunk your hat in warm water. Remove and roll up in a dry towel. Place over a balloon or head sized object and leave to dry. This entry was posted on Saturday, June 2nd, 2018 at 4:06 pm and is filed under Blog, Knitting Patterns for Hooters Hall Handspun Yarn. You can follow any responses to this entry through the RSS 2.0 feed. Both comments and pings are currently closed.